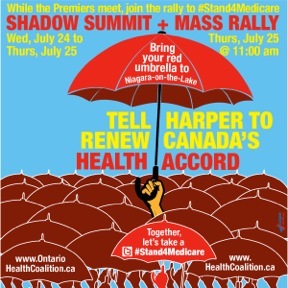 (July 24-25, 2013) Many thanks to everyone for coming out to last week’s Shadow Summit and Mass Rally to Uphold National Public Medicare and win a Renewed Health Accord in 2014. More than 2000 people came out to call on the Premiers during their Council of the Federation meeting in Niagara-on-the-Lake to demand that Stephen Harper return to the negotiating table for a renewed Health Accord. Our goal was to put health care on the agenda as this was the last Council of the Federation – a meeting of all the provincial and territorial Premiers from across Canada – before the expiration of the Health Accord in 2014.